Major Differences include at least one significant change to a product's front cover. Major differences are generally very obvious when viewing a picture from an auction listing. Products with major differences may also include medium and minor differences. Medium Differences include at least one significant change to a product's back cover or other content (such as a map). Medium differences would be easy to detect in an auction picture if the seller provided an image of the back cover and/or the other content. Products with medium differences may also include minor differences. Minor Differences include small detail changes to the interior or exterior of a product. You typically wouldn't notice minor differences unless you were intentionally looking for them. A version name next to each version indicates the latest copyright date on the product (sometimes a product has multiple different copyright dates on it), and/or the edition or printing number & date as specified on the product, and often one or two other unique features for that version. Following that, images and notes capture the distinguishing details of each version of the product. "Released" shows an estimated date of release based on clues such as the information shown by its catalog page, the presence of a UPC Barcode, the copyright date, and so on. "Printer" is an abbreviation of the printer (if any) listed in the credits or elsewhere in the product. If no printer info is listed, this will say, "none." "IFC" and "IBC" stand for inside front cover and inside back cover, respectively, and identify the content (if any) on those pages. Help/Contact: If you have a variation of a product that I don't have listed here, or if you can supply better page images, corrections, or additional info, please let me know: guyf@mac.com. Special Thanks: James Gracen and Joseph of Intelligator's Game Lair have been very helpful with supplying images and tracking down differences between products. Legal: All MERP products depicted on this page are Copyright © TOLKIEN ENTERPRISES, a division of ELAN MERCHANDISING INC., Berkeley CA. The Hobbit, The Lord of the Rings, and all characters and places therein are trademark properties of TOLKIEN ENTERPRISES. The order of products below is somewhat arbitrary. The rulebooks and rules supplements are first, followed by the other products in approximate order by product number. However, when a given kind of product (such as Campaign Modules or Adventure Modules, etc.) went back and used lower numbers for later products, the products are ordered with the later (lower numbered) products after the earlier ones. The following links use the major, medium, and minor colors to show which items have documented variations. Front cover shows the title with black letters on the red background at the top. Back cover shows 1984 copyright. Back cover has a white compass design near the top. Back cover talks in the future tense ("will include") about the campaign modules and adventure modules, and lists some early working names for products: "Moria I, the Dwarven City", "Arthedain, Last Free Kingdom of the North". Back cover shows Campaign and Adventure Guidebook, 6 early campaign modules, and the Bree and the Barrow Downs adventure module. Contents page shows 1984 copyright. The eight-page catalog mentions various upcoming products: Arthedain, Riders of Rohan, Moria I ("Available Summer 1984"), and includes a list of 34 items. This particular list is the earliest use that I have found of the Rick DeMarco illustration of three men, which is used on many of the product listing. Also, note how one of the pictures on the Loremaster page strongly resembles Arnold Schwarzenegger. Front cover shows the title with white letters on the picture background, and also rearranges several other pieces of graphics and text. Back cover no longer has the white compass design. Back cover no longer talks in future tense about the modules, and includes the final names for Moria, the Dwarven City and Rangers of the North, the Kingdom of Arthedain. Back cover adds captions to the three groups of products, and now shows an additional campaign module, the MERP rulebook (ironically not the same cover as itself), and three additional adventure modules. Back cover adds "ICE800" next to the ISBN, indicating an $8 price. Credits page has a slightly larger gap between the map and the start of the credits. The eight-page catalog treats Moria and Rangers of the North as available products. and includes a list of 32 items. Also, note how one of the pictures on the Loremaster page strongly resembles Sting. Front cover adds "STOCK #8000" at the top right. Back cover adds "STOCK #8000" at the bottom right. Instead of an eight-page catalog, this one contains an eight-page "Introduction to Fantasy Role Playing" pullout section, whose last page includes a catalog. Catalog page shows "Winter 1985 Catalog" and includes released products from as late as 1985. This is the version released by Games Workshop in the U.K.
‡Version: "2nd U.S. Edition, July 1986." Complete redesign of the front and back cover, as well as a reorganized and expanded interior. Back cover shows 1986 copyright. Back cover shows "ICE10.00", indicating a $10 price. Credits page shows 1986 copyright and "2nd U.S. Edition, July 1986." This one doesn't have "STOCK #8100" on various parts of the box. I need a good picture/scan. This has revised box art (to match 8000 Version E), and new contents: A 32 page intro adventure book, and cardboard stand-up "miniatures" (replacing the counters). Back cover shows "ICE500" which indicates a $5 price. Back cover replaces copyright, ISBN, and "ICE500" with UPC barcode box which also contains the ISBN. The last five digits of the UPC barcode (00600) indicate a $6 price. 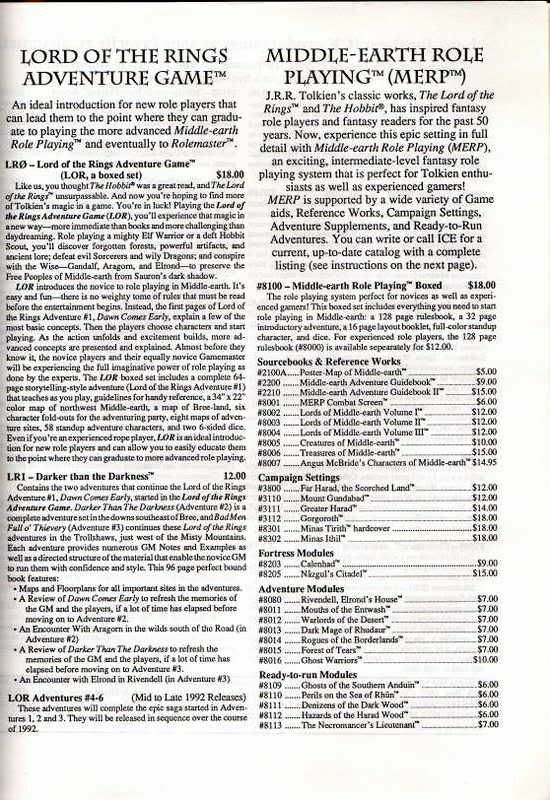 The earliest reference for a $6 price for this is a catalog page from 3200 Lorien, which was released in 1986, so this was likely printed in 1986 or later. Back cover shows "Printed in Hong Kong". The Cirith Ungol panel shows copyright 1984. Complete redesign of the covers to look like the 1986 versions of the MERP rulebook. Back cover shows 1984, 1989 copyright. Back cover shows UPC barcode whose last five digits (00600) indicate a $6 price. Front cover shows 1982 copyright. Front cover ICE logo does not have a registered trademark symbol. Back cover shows 1982 copyright. Back cover descriptive text is overlaid on top of the Middle-earth map. Contents page shows 1982 copyright. Contents page shows the incorrect product number ("#ME 2100"). Credits page shows printer credit: "Printed by Kaminer and Thomson, Inc., Charlottesville, Va."
Contents page shows 1982, 1983 copyright. Credits page shows printer credit: "Printing: Bassett Press". Catalog page shows products released as late as 1983. Front cover text is vertically shifted down compared to the previous versions. Note how the "B" of "Based on J.R.R. TOLKIEN's..." is now partially covering the river, whereas the "B" of earlier versions is entirely over top of the shore. Back cover has ISBN and "ICE900" which indicates a $9 price. Another instance of this version (along with various interior details) can be found at Tome of Treasures: http://www.tomeoftreasures.com/forum/viewtopic.php?t=2881. Back cover shows a UPC barcode near the bottom-left, covering up where the lettering key would be. Estimated release date for this version is 1987 or later, due to the "computerized" looking font used for the ISBN within the white UPC barcode box. ‡Version: "Second U.S. Printing, January, 1990." Front cover prominently shows "second edition" near the title. Front cover ICE logo has a registered trademark symbol. Back cover descriptive text is separate from the Middle-earth map. Contents page shows 1982, 1983, 1989 copyright and "Second U.S. Printing, January, 1990." ‡Version: "First U.S. Edition, 1989." Contents page shows 1989 copyright and "First U.S. Edition, 1989." Contents page does not have a Printer entry. Catalog page shows released products from as late as 1982. Note: Relative to the previous version, this revised version's content has been significanly rearranged & expanded, and has many differences among the maps. Contents page has a Revision Editor entry: "Revision Editor: Terry K. Amthor"
Contents page has a Printer entry: "Printer: Kaminer and Thomson, Charlottesville, Va."
Catalog page shows released products from as late as 1983, which may mean this is a later printing (from 1983 or later). ‡Version: 1982 "Proudly Printed in Australia"
History: Bruce Neidlinger (CEO of ICE) provided an explanation of the history of this Australan version: "We printed [this version of] Angmar ourselves- it was an early outsourcing effort and was not repeated." Thanks for the info, Bruce! Note: Except as described below, this version's content is the same as the 1982 Revised version. Catalog page has a "Proudly Printed in Australia" logo at the bottom-right. Credits page shows printer credit: "Printed by Kaminer & Thomson, Charlottesville, Virginia." Catalog page shows a map and bibliography. The detail images for this version are hosted by Tome of Treasures. You can see them in their original context (along with various interior details) here: http://www.tomeoftreasures.com/forum/viewtopic.php?t=423. Credits page does not include printer credit. Catalog page shows released products from as late as 1983. Catalog page shows Ship Summaries instead of a map and bibliography. Do you have a copy of this version without the printing mistake mentioned by the Tome of Treasures page? (This version may not exist.) Various fan sites show this with a publication date of 1982, although I've never seen one with a 1982 copyright date. Every copy I've been able to inspect or have someone inspect for me has shown a copyright date of 1983. If you have one with a 1982 copyright date, I'd love to see scans of the relevant pages. Back cover shows 1983 copyright. Contents page shows 1983 copyright. Credits page shows the printer: "Printed by Kaminer & Thomson, Charlottesville, Virginia." Credits page does not list the printer. Front cover shows "Northern" diagonally across the top-left corner, and shows three people in a woodland setting. Back cover shows map of Middle-earth and has vertically aligned product description text. Contents page shows printer credit: "Printer: Kaminer & Thomson, Inc., Charlottesville, VA". 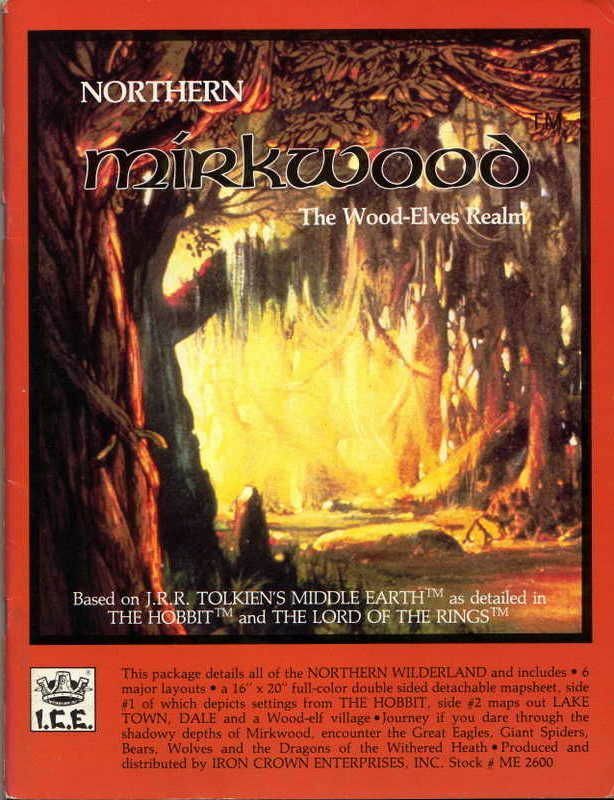 Front cover shows "Northern" horizontally at the top-left of the cover, and shows a still image of a woodland setting from the 1978 animated "The Lord of the Rings" film. Back cover shows ISBN and "ICE1000" indicating $10 price. 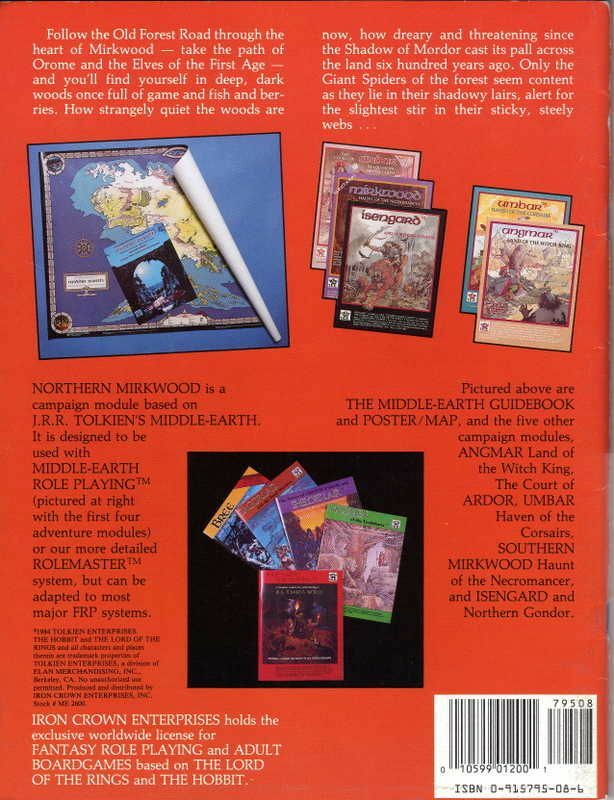 Back cover shows various MERP products: Campaign and Adventure Guidebook, 5 early campaign modules (and doesn't show a cover picture of the 1983 version of Northern Mirkwood), and MERP rulebook + 4 early adventure modules. Contents page shows ISBN instead of printer credit. Inside front cover is a grayscale map of Middle-earth with an inset area depicting the area covered by the module. Inside back cover is the catalog page. The detail images for this version are hosted by Tome of Treasures. You can see them in their original context (along with various interior details) here: http://www.tomeoftreasures.com/forum/viewtopic.php?t=2935. Back cover adds UPC Barcode with last five digits 01200 (indicating $12 price) and moves the copyright paragraph. Please let me know if you can supply images of the relevant pages. Credits page shows printer credit: "Printed by Kaminer & Thomson, Charlottesville, VA;". Credits page does not show printer credit. The detail images for this version are hosted by Tome of Treasures. You can see them in their original context (along with various interior details) here: http://www.tomeoftreasures.com/forum/viewtopic.php?t=2943. Back cover shows ISBN and "ICE1200" indicating $12 price. Catalog page shows released products from as late as 1986. Please let me know if you can supply images of the other relevant pages. Front cover "isengard" title is not left-aligned on the picture, and is almost centered (horizontally) on the picture. The "AND NORTHERN GONDOR" text overlaps the top of the tower slightly. Front cover shows "Stock # ME 2800" at the bottom. Back cover does not show an ISBN or price. The map on page 9 shows the region as far northeast as Mirkwood. Images provided by J. R. January (aka Aneoth), the seller for the auction listing where this version was found. Back cover shows "ICE1000" which indicates a $10 price. Front cover "isengard" title is now left-justified on the picture. The "AND NORTHERN GONDOR" text no longer overlaps the top of the tower. Front cover omits the "ME" in the stock number and instead shows "Stock # 2800" at the bottom. Back cover shows zoomed Northern Gondor map area and has more product details. Back cover shows 1987 copyright. Back cover shows UPC barcode, whose last five digits (01200) indicate a $12 price. Contents page shows 1987 copyright. Catalog page shows a small version of the standard "Three Men" Product Listing. The map on page 9 has changed stylistically and now shows a smaller area. Back cover shows ISBN and "ICE 1000" indicating a $10 price. Credits page shows printer credit: "Printed by: Spencer Printing, Richmond, VA". Catalog page shows released products from as late as 1984. Inside front cover has a topographical map of Moria above a cross-section map of Moria. Inside back cover has a map of The West Gate above maps of Dimrill Dale and The East Gate. Another instance of this version (along with various interior details) can be found at Tome of Treasures: http://www.tomeoftreasures.com/forum/viewtopic.php?t=2962. Front cover adds "STOCK #2900" at the top-right. Back cover adds "STOCK #2900" at the bottom-right. Credits page changes the printer credit to: "Printed by: Expert Graphics, Richmond, VA". Catalog page shows "Winter 1985," which indicates a likely printing date. Front cover no longer has "STOCK #2900" at the top-right. Back cover shows ISBN and "ICE 1200" indicating a $12 price. Back cover shows UPC Barcode with the last five digits (01200) indicating a $12 price. Back cover no longer has "STOCK #2900" at the bottom-right. Credits page shows printer credit: "Printed by: Expert Graphics, Richmond, VA". Catalog page is the standard "Three Men" Product Listing. Back cover shows various MERP products: Campaign and Adventure Guidebook, 7 early campaign modules, and MERP rulebook + 4 early adventure modules. Back cover has longer prose description of the book's contents. Back cover shows 1984 copyright (but see contents page). Back cover shows "ISBN 0-915795-22-1" "ICE1000" on bottom-right, and the latter indicates a $10 price. Contents page shows 1985 copyright. Inside front cover shows a map of Middle-earth, with a small frame bordering the area covered by the book. Inside back cover shows a product catalog with MERP and Rolemaster items up through roughly 1984-1985. The catalog detail image is from another source (Tome of Treasures); you can see it in its original context (along with various interior details) here: http://www.tomeoftreasures.com/forum/viewtopic.php?t=2970. Front cover adds "STOCK #3000" at the top-right. Back cover adds "ICE 10.00" and "STOCK #3000" near the ISBN. Back cover adds "MADE IN USA" under the top two pictures. Please let me know if you can supply better images for the front, back, contents, credits, etc. Back cover shows zoomed Arthedain map area. Back cover has shorter prose description of the book's contents. Back cover has technical details of the book's contents (maps, layouts, etc.). Back cover shows a UPC barcode with number 10599 01200 (indicating $12 price) and "ISBN 0-915795-22-1." Contents page shows 1985 copyright and is fundamentally identical to 1985 version's contents page. Credits page is fundamentally identical to 1985 version's credits page. The map at the bottom of page 47 ("11.4 The Lossoth Village of Mulkan") is missing. My copy (which I did not open from the original shrinkwrap) includes a loose half-page sheet with the the appropriate map, and it appears to have been provided by the publisher. Back cover shows various MERP products: Campaign and Adventure Guidebook, 8 early campaign modules, and MERP rulebook + 4 early adventure modules. Back cover shows 1985 copyright. Back cover shows "ISBN 0-915795-29-9" "ICE10.00" on bottom-right, and the latter indicates a $10 price. Contents page Interior Art credit only includes Liz Danforth. Contents page shows printer credit: "Printing: Expert Graphics, Richmond VA. Does not include a full-color 20 mile/inch regional map of any sort. 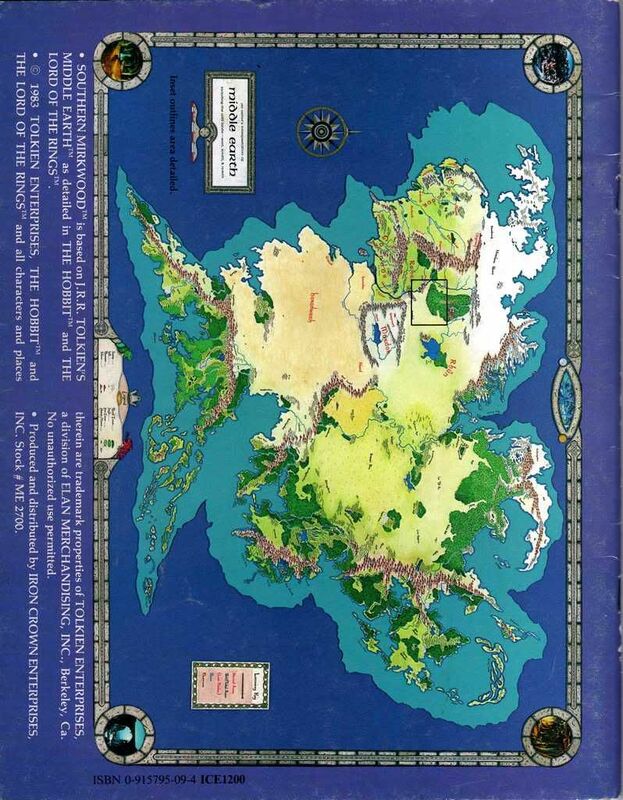 Inside front cover is a map of Middle-earth with inset areas depicting the regions covered by the module. Inside back cover is the product catalog. ‡Version: "Second U.S. Edition, November 1987"
Back cover shows zoomed Rohan map area. Back cover shows a UPC barcode with number 10599 01200 (indicating $12 price) and "ISBN 0-915795-29-9." Contents page shows 1985, 1987 copyright. Contents page shows "Second U.S. Edition, November 1987". Contents page Interior Art credit adds Jim Holloway and Olivia Johnston. Contents page does not show a printer credit. Includes a new full-color regional map, which is the same image as used for map #5 from the Northwestern Middle-earth Map Set. Inside front cover is a topographical map of Rohan. Inside back cover is a larger area map of Southern Mirkwood and the Wold. Back cover barcode box also contains "ISBN 0-915795-42-6 #3200". Contents page shows 1986 copyright and says "First U.S. Edition 1986." 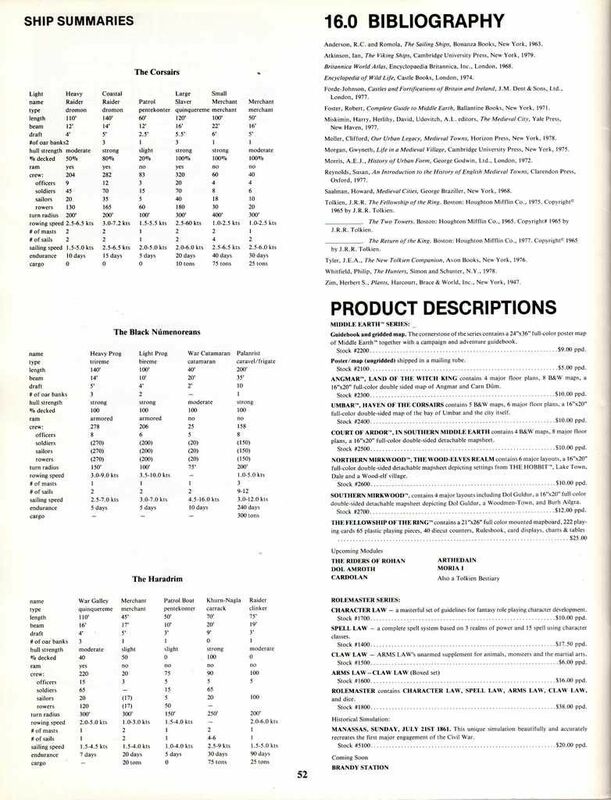 Credits page has a Printer entry: "Printer: Expert Graphics, Richmond, VA."
The second-to-last page (63) is an Iron Crown Enterprises product catalogs with products for MERP, Middle-earth Board Games, Rolemaster, and Space Master. The latest products are from approximately 1985. Note that the early campaign modules have risen in price from $10 to $12, and the early adventure modules have risen from $6 to $7. The last page (64) is a Hero System product catalog with products for Champions, Danger International, Fantasy Hero, Justice, Inc., and Adventurer's Club Magazine. Back cover barcode box does not show an ISBN number or product number. Credits page does not include a Printing entry. The second-to-last page (63) is blank. The last page (64) is the standard "Three Men" Product Listing. Inside front cover and inside back cover are blank. *Version: "First U.S. Edition 1987"
Front cover shows lowercase "the" in "the HOBBIT™" and "the LORD OF THE RINGS™". Contents page shows 1987 copyright and "First U.S. Edition 1987." I don't have good contents page or credits page images. Please contact me if you can provide them. ‡Version: 1987 "Second U.S. Edition"
Front cover shows uppdercase "THE" in "THE HOBBIT™" and "THE LORD OF THE RINGS™". Front cover has a few minor/subtle layout differences. Contents page shows 1987 copyright and "Second U.S. Edition". Speculation: I imagine this reprint was done specifically to correct the capitalization glitch on the cover. ‡Version: "First U.S. Edition 1987." *Version: "Second U.S. Edition 1987." Contents page shows 1987 copyright and "Second U.S. Edition 1987." Contents page now has a small gap between sections 9.2 and 9.3, and those two sections are not horizontally aligned to one another. Catalog page shows a small product listing with some of the text from the standard "Three Men" Product Listing. ‡Version: "First U.S. Edition, 1987." Contents page shows 1987 copyright and "First U.S. Edition, 1987." ‡Version: "First U.S. Edition, Sept. 1987." Contents page shows 1987 copyright and "First U.S. Edition, Sept. 1987." No catalog page. Inside front cover has a map of Vinyalonde above a map of Lond Daer Enedh. Inside back cover has a map of Metraith above a map of the Processional Road. ‡Version: "First U.S. Edition, Aug. 1988." Back cover shows 1988 copyright. Contents page shows 1988 copyright and "First U.S. Edition, Aug. 1988." No catalog page. Inside front cover and inside back cover are blank. ‡Version: "First U.S. Edition, July 1988." Contents page shows 1988 copyright and "First U.S. Edition, July 1988." ‡Version: "First U.S. Edition, Oct. 1988." Contents page shows 1983, 1988 copyright and "First U.S. Edition, Oct. 1988." Back cover shows 1989 copyright. Inside front cover has a map of an Orcish Cave System above a map of an Orcish Stockade. Inside back cover is the catalog page. Note: This campaign module features a unique back cover layout amongst the stapled campaign modules, with the title going all the way across the top of the back, and one blurb moved ("A Campaign Module suitable for use with ..."). ‡Version: "First U.S. Edition, 1990"
Back cover shows 1990 copyright. Contents page shows 1990 copyright and "First U.S. Edition, 1990". Catalog page first paragraph has a date of 3/20/90, and shows released products from as late as 1989. Last page (not pictured) is an advertisement for Middle-eart Role Playing figures by Mithril Miniatures. ‡Version: "First U.S. Edition, 1992"
Note: The credits page image is from a different source than the front & back cover images. (My copy is mint condition, and I didn't want to stress the binding to scan the credits page.) The catalog pages are likewise from a third source (Tome of Treasures); you can see them in their original context (along with various interior details) here: http://www.tomeoftreasures.com/forum/viewtopic.php?t=3029. Back cover shows 1992 copyright. Credits page shows 1992 copyright and "First U.S. Edition, 1992". The catalog pages show mostly 1990 and earlier products, except for the (released) Lord of the Rings Adventure Game products which were from as late as 1991. There is a reference to a $12 version of 8000 and an $18 version of 8100, which suggest a late printing of both of those (which I don't have any other evidence of). *Version: "First U.S. Edition, 1992." Back cover shows "ICE2000" indicating $20 price. Credits page shows 1992 copyright and "First U.S. Edition, 1992." Catalog page shows mostly 1990 and earlier products, except for the (released) Lord of the Rings Adventure Game products which were from as late as 1991. There is also a reference to a $12 version of 8000 and an $18 version of 8100, which suggest a late printing of both of those (which I don't have any other evidence of). Catalog page shows 2nd Edition MERP products from 1993. ‡Version: "First U.S. Edition 1986." Contents page shows 1986 copyright and "First U.S. Edition 1986." Credits/Catalog page shows an artwork-less version of the standard "Three Men" Product Listing. *Version: "Second U.S. Edition 1988." Contents page shows 1986 copyright and "Second U.S. Edition 1988." Credits/Catalog page shows a combination of ICE and Hero System products: Middle-earth Role Playing, Rolemaster, Space Master, Champions. Right column, top-to-bottom: Danger International, Fantasy Hero, Adventurer's Club Magazine, IQ (Iron Crown Quarterly). The book is 11" tall. Contents page does not show a copyright date. Page 108 contains Selected Reading entries, and the page header says "Seleced Reading". Dimensions are 8-1/2" x 11". Contents page shows 1989 copyright and "First U.S. Edition, January 1989". Catalog page is similar to the standard "Three Men" Product Listing, but somewhat reorganized. ‡Version: "First U.S. Edition, Nov. 1988." Back cover shows UPC barcode with the last five digits (01000) indicating a $10 price. Contents page shows 1988 copyright and "First U.S. Edition, Nov. 1988." Update: I have evidence from another collector that there are probably be two variations/printings of this product, which may only be distinguishable by the physical dimensions of the book, and possibly color saturation. Details will come in a future update. ‡Version: "1st U.S. Edition, 1989." Back cover shows UPC barcode with the last five digits (01500) indicating a $15 price. Contents page shows 1989 copyright and "1st U.S. Edition, 1989." Catalog page is the standard "Full Page 1989" Product Listing. Back cover shows UPC barcode with the last five digits (01495) indicating a $14.95 price. Credits page shows 1990 copyright and "First U.S. Edition, 1990". Catalog page shows released products from as late as 1990. The interesting details are the products which aren't listed, possibly indicating which products were completely out of print. The inside back cover is a "Map of Locations" where the various events depicted in the book took place. Front cover shows "Stock #RP 8010" (not "Stock #8010") at the end of the bottom blurb. Back cover shows "Stock #RP 8010" (not "Stock #8010) at the end of the bottom blurb. Front cover shows "Stock #8010" (not "Stock #RP 8010") at the end of the bottom blurb, and "Stock #" and "8010" at the top right. Back cover shows "MADE IN USA" below the top blurb. Back cover shows "Stock #8010" (not "Stock #RP 8010) at the end of the bottom blurb. Back cover shows "STOCK #8010" below the left column of the bottom blurb. Back cover shows "ISBN 0-915795-16-7" and "ICE6.00" below the right column of the bottom blurb. Contents page: I don't have a suitable image for display, but I believe it's the same as that of the 1984 version. Please let me know if you have a 150 dpi image available. Credits page: I don't have a suitable image for display, but I believe it's the same as that of the 1984 version. Please let me know if you have a 150 dpi image available. Trivia: On the back cover, there is a picture of the red MERP box. This image is too big, and is likely the image which was used to generate the entire box-top for the boxed set. Notice that the text which would appear on the sides of the box top is also shown in the picture. Front cover shows "STOCK #8020" at top right. Back cover shows "MADE IN USA" below the Guidebook & Poster/Map picture. Back cover shows "ICE6.00" and "STOCK #8020" below the copyright blurb. I've seen mention of "several variations" for this module, where some have color maps and others have black & white maps: http://www.trollandtoad.com/p138691.html. I own two of these variations, with which may or may not be all of the "several variations" that page mentions. If you can provide evidence of a different variation, please let me know. Back cover shows 1984 version of the MERP rulebook. Contents page is in color; note the purple/pink spider background graphic. Catalog is four pages bound into the center of the module, and shows products up through 1984. The cover and all interior pages are glossy paper. There is a color regional map on the inside front cover, a color map on page 32, and another color map on the inside back cover. Front cover adds "STOCK #8030" at the top-right. Back cover shows 1986 version of the MERP rulebook, adds "MADE IN USA" in the middle, moves the copyright blurb to above the Bree module, and adds a UPC Barcode whose last five digits (00700) indicate a $7 price. Contents page is in color; note the gray spider background graphic. Only the cover (front, back, inside front, and inside back) are glossy paper; the rest are conventional paper. There is a color regional map on the inside front cover, and another color map on the inside back cover, but the map on page 32 is not color. Contents page shows printer credit: "Printing: Litho Artists, Charlottesville, Va."
Back cover no longer shows copyright, but adds a UPC barcode with last five digits (00700) indicating $7 price. Contents page shows a different printer credit: "Printing: South Sea International Press Ltd, Hong Kong". Back cover shows "I.C.E.6.00" and "ISBN 0-915795-35-3" below "St.#8050" near the bottom-right. Contents page shows printer credit: "Printing: J.P. Bell, Lynchburg, VA."
Catalog page shows released products from as late as 1985. Back cover shows UPC barcode with number 10599 00700 (normally indicating a $7.00 price), with "ISBN 0-915795-35-3" above the barcode. Contents page does not include a printer credit. Back cover shows "ICE6.00" and "ISBN 0-915795-39-6" below "St. #8060" near the bottom-right. Contents page shows printer credit: "Printing: The Hickory Printing Group, Inc., Hickory, NC". Back cover shows UPC barcode with number 10599 00700 (normally indicating a $7.00 price), with "ISBN 0-915795-39-6" above the barcode. Back cover shows "ICE6.00" indicating $6 price. Contents page shows printer credit: "Printing: J. P. Bell." ‡Version: "First U.S. Edition May, 1987"
Contents page shows 1987 copyright and "First U.S. Edition May, 1987". 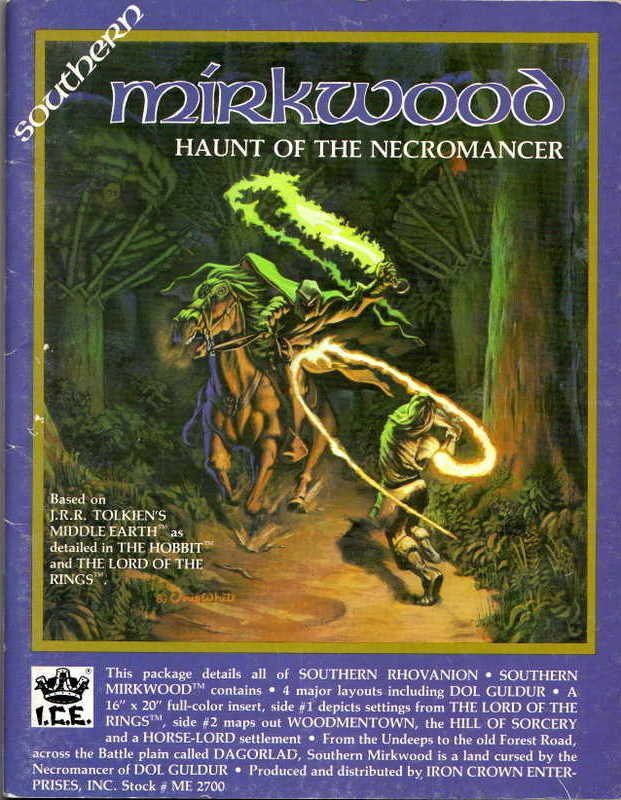 Trivia: The content of Brigands of Mirkwood is more like that of a Ready-to-Run Adventure Module according to this info from page 2: "It is unlike ICE's previously published Adventure Modules, since more space is devoted to the adventures and less is used for background material." Contents page shows "First U.S. Edition, 1987." 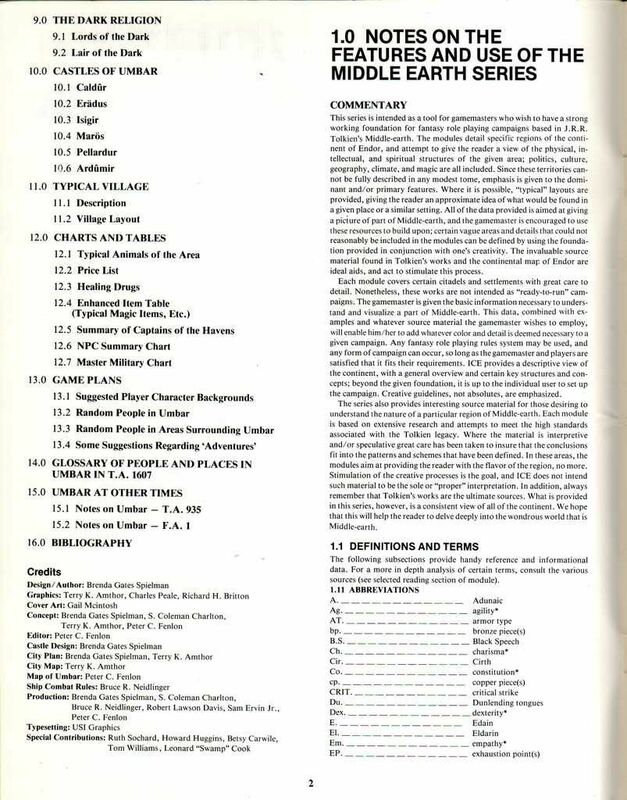 Errata Sheet: I was lucky enough to open this copy from the original shrinkwrap, and it included a loose half-page with a corrected NPC chart. I have no idea whether all releases of this module included the errata sheet. It's possible that earlier releases did not include it, and it's also possible that later printings incorporated the errata directly into the main module text. Trivia: The cover says, "MOUTHS also links with with I.C.E. 's RIDERS OF ROHAN™ campaign module." This may or may not give some insight as to why Riders of Rohan was reprinted in 1987; other products were being set in that region, and cross-promotion is a great way to sell associated products. ‡*Version: "First U.S. Edition, 1988." Contents page shows 1988 copyright and "First U.S. Edition, 1988." ‡*Version: "First U.S. Edition, 1989." ‡*Version: "First U.S. Edition, May, June, 1989." Contents page shows 1989 copyright and "First U.S. Edition, May, June, 1989." ‡*Version: "First U.S. Printing, January, 1990." Contents page shows 1990 copyright and "First U.S. Printing, January, 1990." Trivia: Despite Forest of Tears' product number coming after that of Rogues of the Borderlands, Forest of Tears appears to have been published before Rogues of the Borderlands. ‡Version: "First U.S. Printing, December, 1989." Contents page shows 1989 copyright and "First U.S. Printing, December, 1989." ‡Version: "First U.S. Edition, 1990." Contents page shows 1990 copyright and "First U.S. Edition, 1990." Catalog page shows a half-page list of ICE and Hero System products from as late as 1989-1990. It has the exact same content as the catalog page in 8302 Minas Ithil. Front cover picture wraps around onto approximately 3 inches of the back cover. 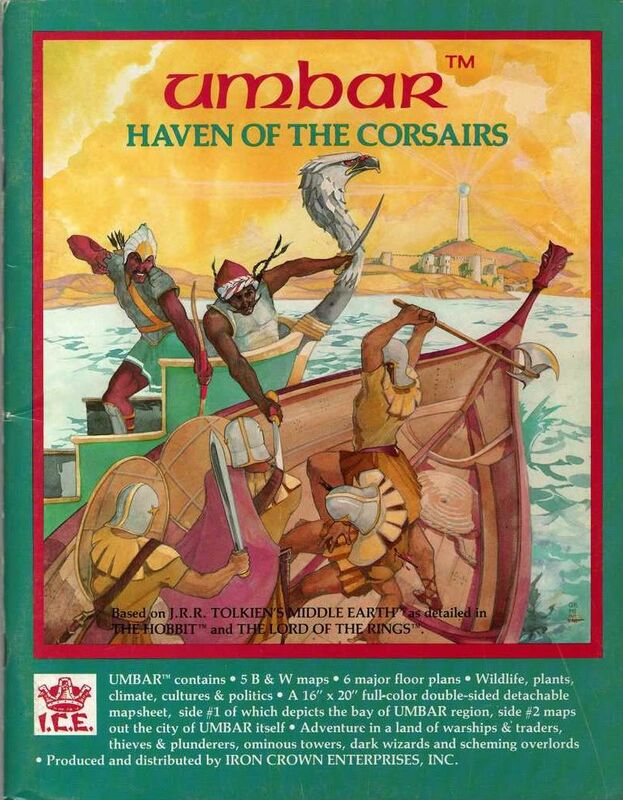 Back cover shows a pencil drawing of one of the adventure sites, as well as an advertisement for the 1984 MERP rulebook + 4 early adventure modules. The last page is a product catalog with MERP and Rolemaster items up through roughly 1985. ‡Version: 1988 "Second U.S. Edition"
Front cover picture does not wrap around to the back cover. Back cover shows a map of the general adventure area, along with brief details about the adventures in the module. Back cover shows 1985, 1987 copyright. Back cover has UPC barcode box, which also contains the ISBN. Contents page shows 1985, 1988 copyright. Contents page says, "Second U.S. Edition." The last page is the standard "Three Men" Product Listing. Contents page shows 1986 copyright. The map on page 10 has three areas marked by the number 2. The "1" denoting Hannei's Tree House on the larger map is very close to the tree. The Cavern Complex map on page 29 shows the number 3 in the gray area of the map. The Cavern of King Gotshelm map shows the number 2 in front of the horse. Contents page adds the following to the end of the "Produced and distributed by" paragraph: "For a complete catalog listing write to ICE." The map on page 10 has only one areas marked by the number 2. The "1" denoting Hannei's Tree House on the larger map further from (and below and to the left of) the tree. There are other minor number position changes. The Cavern Complex map on page 29 shows the number 3 the middle of the corresponding chamber. The Cavern of King Gotshelm map shows the number 2 toward the bottom of the chamber. There are other minor number position changes. Page 31 shows a small product listing with some of the text from the standard "Three Men" Product Listing. ‡Version: "First U.S Edition, February 1987"
The dimensions, inside cover quality, and paper quality/color are virtually identical to the Taller second edition below. Contents page shows 1987 copyright and "First U.S Edition, February 1987". Catalog page shows a half-page product listing with some of the text from the standard "Three Men" Product Listing. Inside front cover shows a map of the Bay of Belefas Region. Dimensions are 8-1/2" x 10-15/16". The inside front cover and inside back cover have a shiny finish. The interior pages have a slight yellowish hue. Contents page shows 1987 copyright and "Second U.S. Edition, July 1987". The inside front cover and inside back cover have a matte finish. The interior pages are bright white. ‡Version: "First U.S. Edition: May 1987"
Contents page shows 1987 copyright and "First U.S. Edition: May 1987". ‡Version: "First U.S. Edition, Nov 1987." Contents page shows 1987 copyright and "First U.S. Edition, Nov 1987." ‡Version: "First U.S. Edition, April, 1988." Contents page shows 1988 copyright and "First U.S. Edition, April, 1988." Note the yellow stripe as part of the picture border, and note the yellow color for the Rolemaster logo at the bottom-right of the picture on the front cover. Not sure whether this is relevant in terms of printings, but it appears to be unique amongst the other modules. Catalog page shows ICE and Hero System products, but is fairly non-specific in terms of dating. 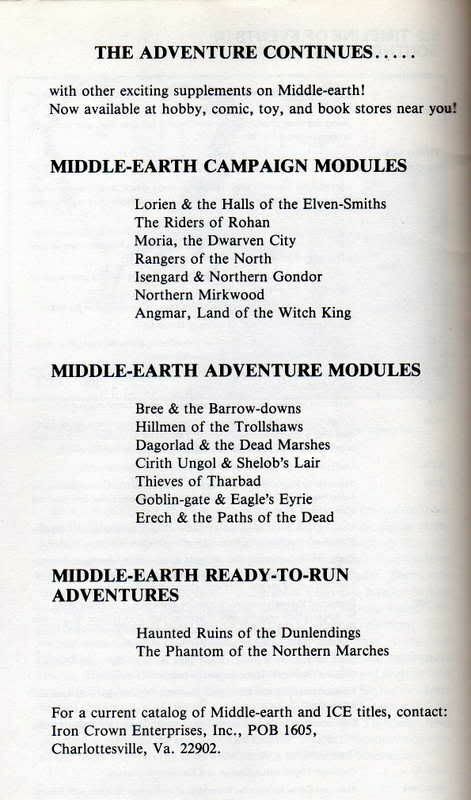 Catalog page shows the four previous Ready-to-Run Adventure Modules, plus 8105 Gates of Mordor. The fact that 8106 through 8108 were not included in this ad makes me suspect 8105 might have had a reprint around 1990. Contents page shows 1992 copyright and "First U.S. Edition, 1992". 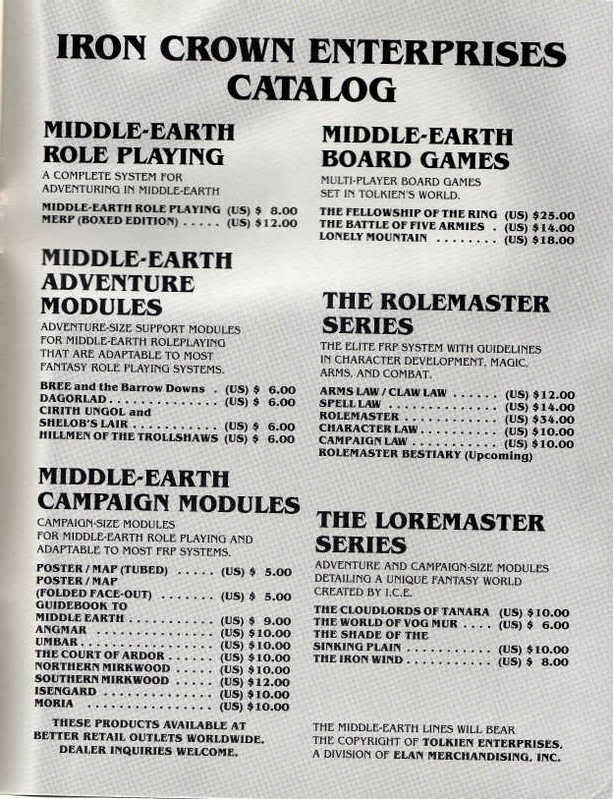 Catalog page is similar to one of the catalog pages in 3113 The Grey Mountains, and includes 1991-era Lord of the Rings Adventure Game products. There is a reference to a $12 version of 8000 and an $18 version of 8100, which suggest a late printing of both of those (which I don't have any other evidence of). Back cover shows UPC barcode with last five digits 00600 indicating $6 price. ‡Version: "First U.S. Edition, 1988." ‡Version: "First U.S. Printing 1990." Back cover shows UPC barcode with last five digits 00900 indicating $9 price. Contents page shows 1990 copyright and "First U.S. Printing 1990." ‡Version: "First U.S. Edition, August 1988." Contents page shows 1988 copyright and "First U.S. Edition, August 1988." ‡*Version: "First U.S. Edition, 1991"
Back cover shows 1991 copyright. Back cover shows "ICE1400" indicating $14 price. Contents page shows 1991 copyright and "First U.S. Edition, 1991". Catalog page shows released products from as late as 1990. (Bladestorm is from 1990.) This is also the earliest reference I've found for the $18 MERP boxed set. ‡Version: "First U.S. Edition, May 1988." Back cover shows UPC barcode with last five digits 01800 indicating $18 price. Title page shows 1988 copyright and "First U.S. Edition, May 1988." Back cover shows ISBN and "ICE 1800" indicating $18 price. Catalog page shows a half-page list of ICE and Hero System products from as late as 1989-1990. It has the exact same content as the catalog page in 8016 Ghost Warriors. 8010 Bree or 8020 Dagorlad with UPC Barcode? The other pre-1986 adventure modules were reprinted at some point with a UPC barcode on the back, with the last five digits (00500) indicating a $7 price. I bet one or more of these two modules did too. Please check yours and let me know. $12 version of 8000 Middle-earth Role Playing? The catalog pages for 3113 The Grey Mountains, 4002 Northwestern Middle-earth Gazetteer, and 8114 River Running show a $12 version of the rulebook. Do you have a copy of the rulebook that shows this price, or shows some other indication of being printed after 1986? $18 version of 8100 Middle-earth Role Playing (boxed edition)? As above, but I'm looking for proof of the boxed edition with a $18 price. Jedko Games (Australian) version of 8100 MERP boxed set? Heroic Worlds (A guide to roleplaying games up through the early 1990s, by Lawrence Schick, published by Prometheus Books) says that Jedko Games published a boxed version of the MERP rules in 1988 (presumably under license from ICE). If you have this, I'd love to see pictures. 1982 version of 2500 The Court of Ardor in Southern Middle-earth? Various fan sites show this with a publication date of 1982, although I've never seen one with a 1982 copyright date. Every copy I've been able to inspect or have someone inspect for me has shown a copyright date of 1983. If you have one with a 1982 copyright date, I'd love to see some proof. Data points refuting the existence of a 1982 version: 11; me (x1), * (x1), Thomas (x1), David (x1), Jan (via eBay) (x1), Brent (x2), Endymion (x1), Deadlord39 (x1 or more), tfm @ ToT (x1), uiriamu2 @ eBay (x1). Lorien has the barcode box on the right, and others have it on the left, including earlier modules in the sequence that presumably had later printings. Compare the barcode box on the later printing of Rangers of the North, for example. Look also at 3400, 3500, etc. This appears to start with Riders of Rohan (1985), at least in terms of the initial editions. This may indicate when versons of earlier modules were reprinted to contain stock numbers at the top-right of their covers. "Three Men" Product Listing circa 1986. The top-half of the page is an illustration of three men in a wilderness setting, by Rick DeMarco, dated '84. 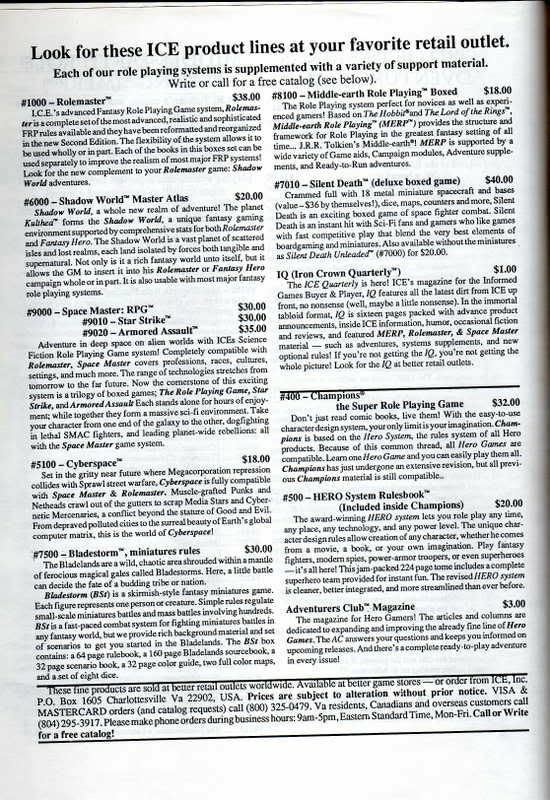 The bottom half of the page talks about a combination of ICE and Hero Games products: Rolemaster, Space Master, Middle-earth Role Playing, Middle-earth Boardgames, Champions, Justice, Inc., Danger International, Fantasy Hero, and Adventurer's Club Magazine. The Adventurer's Club information says it "will begin coverage of the popular I.C.E. lines while retaining all of the regular Hero columns, and features." This coverage sarted in fall 1986. "Full Page 1989" Product Listing. This lists a combination of ICE and Hero Games products: Middle-earth Role Playing Boxed, Rolemaster Boxed, Shadow World, Space Master, Cyberspace, IQ (Iron Crown Quarterly), Champions the Super Role Playing Game, Star Hero, and Adventurer's Club Magazine. The existence of Cyberspace (introduced in 1989) gives a strong clue that this represents a 1989 catalog. Rolemaster first edition products are shown: $17.50 Spell Law, $16.00 Claw Law / Arms Law Boxed Set. Upcoming Arthedain I (aka Rangers of the North) and Moria I have incorrect product numbers indicating a flipped release schedule. Hillmen of the Trollshaws is no longer marked as upcoming. Switches to the Rolemaster second edition versions of Spell Law ($14) and Arms Law / Claw Law ($12). Moria and two board games are no longer upcoming. The Battle of Five Armies has the incorrect price ($18). Fixes incorrect price on The Battle of Five Armies and removes never-to-be-released Loremaster products. Adds Rangers of the North. A couple Rolemaster first edition products marked "while supplies last." Adds Creatures & Treasures. Thieves of Tharbad added as upcoming. Thieves of Tharbad is no longer upcoming. Adds Space Master. The last Rolemaster first edition products are gone, and only Rolemaster second edition products are listed. Thieves of Tharbad is no longer upcoming. Adds Space Master section. The last Rolemaster first edition products are gone, and only Rolemaster second edition products are shown. Adds Ready-to-Run Adventure Modules and changes the category for the Combat Screen. Adds upcoming Giants of the Misty Mountains module, which is an early name for 8103 Trolls of the Misty Mountains.